CUPE 500 scored a major victory in municipal elections this past November. The local, which represents over 5,000 employees working at the City of Winnipeg, called on the city to become a living wage employer, and then elected a city council who would get the job done. A “living wage” is the wage needed to provide the minimum income necessary to pay for basic needs based of the cost of living in a specific community. With financial support from CUPE National, CUPE 500 ran a campaign that urged the city to adopt a living wage policy for all municipally paid workers, including contractors. CUPE combined the campaign with a strategic electoral effort to defeat right-wing candidates and elect progressives. In the past, private contractors could bid on work performed by CUPE members and offer minimum wage labour as the basis for their cost savings. With a living wage policy in place, private companies would no longer be able to pad their bottom line at the expense of front-line workers, and CUPE would be on even footing. With the support of partners across the progressive spectrum—from labour unions to community organizations—CUPE 500 mobilized progressive city council and mayoral candidates to endorse the policy, and then supported those candidates with thousands of hours of door-knocking, phone-calling, leaflet-dropping and fundraising. The local used targeted polling and on-the-ground intelligence to focus efforts where the races were closest. 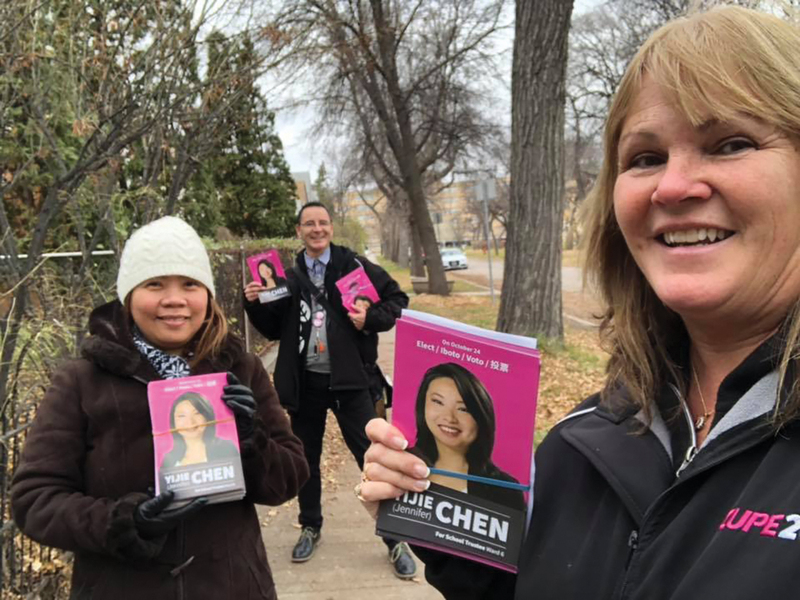 Ultimately, CUPE helped elect two new progressive city councillors in tough races, defended six of our incumbent allies, and beat back a right-wing challenge to Winnipeg’s centrist mayor. Of course, the end of the municipal election is just the start for CUPE 500. The local plans to work with the new city council to find more opportunities at contracting in, to develop a living wage policy to prevent future councils from contracting out, and to advance a progressive agenda throughout the council’s term.